My Mod Pop quilt is almost finished, I have the binding to still put on. I decided to quilt it very traditionally with feathers and echo lines.I wanted the background quilted heavier than the darker curved designs so they stand out. I really enjoy piecing these modern quilt patterns but prefer how they look with traditional quilting. I recently came across a quote by Pablo Picasso that I think is brilliant. I think this is so true of quilting. 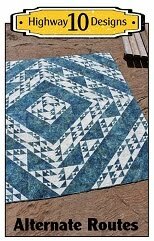 It is important to learn the foundation for good piecing and quilting before you start experimenting. I just wanted to share that thought as it is stuck in my head! The fabrics are all batiks that I collected over a few months, they are not a particular collection. I enjoy the challenge of picking my own fabrics to create the look that I’m hoping to achieve. I hand dyed the backing a light blue-gray, used Quilters Dream Deluxe Cotton for the batting and So Fine thread. The feathers are all free hand and I made them quite large. The only marking I had to do was a circle for the wreath so I had a guide to follow. Oooh, I LOVE this quilt! It is beautiful! Wonderful quilting too. Congrats on a great job! As usual, you picked exactly the right quilting for the quilt. I love your work. wonderful! love the fabrics and the quilting is beautiful as always. Perfect quilting choices. The back looks great. That is beautiful. I did my first feathers on my runner last week. It's nice to see other feather to see where I need to improve. Your's will help me greatly. Your pictures are beautiful. Another beautiful quilt! Although I really like seeing all the pieces you work on, I enjoy this one being yours from start to finish. Another beauty! I love your feathers on this, it still reads modern, the background has a lovely graphic detailed design. I think your feathers were a perfect choice. I rather prefer the open space that feathers create, heavy quilting makes the quilt so dense. absolutely beautiful Kathy, again, you shine. Absolutely beautiful! I love your feathers. The quilting is so beautiful, I love feathers! Love it, Kathie! Another inspirational quilt you've made. love love LOVE it - adore the mod pops and your awesome quilting!!! Did I mention I love this? Gorgeous. :D Looking at the back, it's a quite modern flavor you got with the feathers, anyway! Your quilt is just gorgeous! The feathering is amazing. Awesome job! 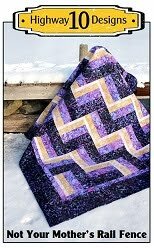 Wow, I love the quilt and how you chose to quilt it! Perfect! The quote is apt! Wow, that is beautiful! There's something about blue isn't there, especially when it's draped across snow. I'm impressed by your feathers and wonder if you do that on a home machine or a longarm machine. Just lovely! I love the quilt...but your quilting really made it for me! Beautiful quilt!!! 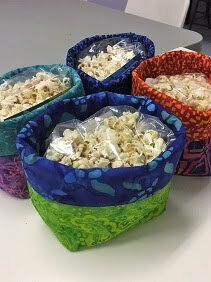 Love the way you quilted it too! Great job! Just love your quilt! 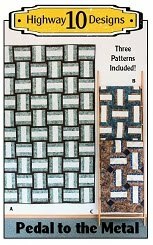 And your quilting is perfect for this quilt! This is gorgeous, Kathy! 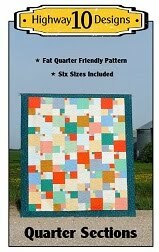 I love the colours you chose are your quilting is fabulous! I'm hosting TGIFF! this week -- why don't you link this up? Beautiful quilt and outstanding quilting. Wow! This is so lovely! Your quilting is divine! It's awesome and great pics too. Yay, I'm so glad you linked up to TGIFF! This really is gorgeous, Kathy! Lovely! I'm with you on choosing my own fabric and not simply using a collection. That is half the fun. I also think it is fun to combine traditional and modern. I think Your feathers worked well. 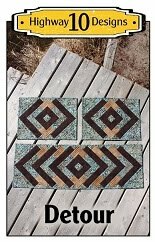 I absolutely love the colors, the pattern and most of all your quilting. This is one of my inspiration quilts now!